The two-year-old son of an ethnic Uyghur couple detained in a political “re-education camp” in northwest China’s Xinjiang Uyghur Autonomous Region (XUAR) has drowned after falling through ice into an irrigation ditch in Hotan (in Chinese, Hetian) prefecture, according to local officials. Sources recently told RFA’s Uyghur Service that Rahmutullah Shirbaqi disappeared from his home in Qaraqash (Moyu) county’s Zawa township on Dec. 21, while in the care of his grandfather, 78-year-old Matnury Mahsut, and grandmother, 68-year-old Mahtumhan Tursunniyaz. Shirbaqi’s body was found three days later and authorities determined that he had drowned after plunging through ice covering a ditch in front of his house in Chokanjilgha village, where his grandparents had raised him since his parents were sent to the Bostankol Re-education Camp in the county seat a year earlier. An officer at the Hotan prefecture police headquarters told RFA that she was not authorized to discuss Shirbaqi’s case, while two officials from the prefectural government said they had heard a two-year-old boy had died, but were unsure of other details. However, a resident of a neighboring village in Qaraqash told RFA on condition of anonymity that his local ruling Communist Party secretary had recently cautioned villagers to be extra vigilant with their children because of a drowning in the area. “He said we need to take good care of our kids at home because a boy died falling into a ditch,” the resident explained, adding that village officials said the boy’s parents had been detained in a re-education camp, where authorities have detained Uyghurs and other Muslim ethnic minorities accused of harboring “strong religious views” and “politically incorrect” ideas throughout the XUAR since April 2017. While seeking additional information about Shirbaqi’s death, RFA contacted an officer from the Qaraqash county police department, who said the boy has a sister who is a junior at Zawa township’s No. 2 Middle School. “She told the school when her brother disappeared,” the officer said. The officer said the weather had been quite cold in Hotan in recent weeks and that ice had formed on top of area irrigation ditches around the time Shirbaqi drowned. He said he was unsure whether Shirbaqi’s parents had been sentenced to prison or if they were being held at a re-education camp—only that they “weren’t at home” when the boy went missing. But officials from Chokanjilgha village confirmed Shirbaqi’s parents had been detained at the Bostankol Re-education Camp, with one local police officer saying they were sent to the facility around one year earlier for “a phone issue,” without providing further details. “The grandparents have pled to meet with the parents, saying their health is poor … but the police guarding the camp won’t let them in,” she said. Shirbaqi accompanied his grandparents during their last attempt to visit his parents on Dec. 18, the village official said, just days before he went missing. She said it was unclear whether his parents are aware of his death. While Beijing initially denied the existence of re-education camps, chairman of the XUAR, Shohrat Zakir, told China’s official Xinhua news agency in October that the facilities are an effective tool to protect the country from terrorism and provide vocational training for Uyghurs. Adrian Zenz, a lecturer in social research methods at the Germany-based European School of Culture and Theology, has said that some 1.1 million people are or have been detained in the camps — equating to 10 to 11 percent of the adult Muslim population of the XUAR. 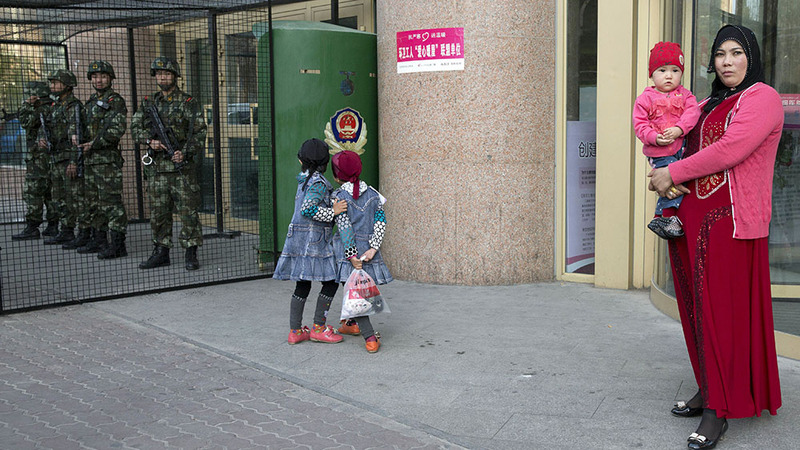 An Oct. 21 report by the official Global Times promoting the camps as “training centers” also included photos of children in Hotan prefecture whose parents had been placed in camps, and claimed that they are warmly cared for at special “schools,” where they engage in educational courses and other activities. RFA has received several reports of Uyghur children in the XUAR dying or suffering severe injuries while their parents are detained and they lack adequate care. In August, sources told RFA that a 10-year-old boy from Kashgar (Kashi) prefecture’s Makit (Maigaiti) county, whose parents were being held in a re-education camp, had drowned in the area’s Zerepshan River. In March, sources reported that eight-year-old Esma Ahmet, whose father was being held at a political re-education camp, had suffered burns to nearly 60 percent of her body a month earlier when a stove overturned at her home in Hotan’s Guma (Pishan) county, and was in urgent need of medical treatment. The sole purpose of this story of a boy drowning is to put the blame of his death squarely on the shoulders of the government. Nice try but it won't stick.